A total of 841 minutes of Premier League football has been played at Anfield since Liverpool conceded a goal to the opposition. Michail Antonio’s consolation for West Ham United during a 4-1 Reds victory in February was the last time Jürgen Klopp’s men were breached at home in the top flight. That run encompasses nine consecutive clean sheets, the most recent secured against Manchester City on Sunday despite the champions winning an 86th-minute penalty that Riyad Mahrez fired over. One defender has started every game in that streak: Virgil van Dijk. “It’s credit to everyone,” the No.4 told Premier League Productions. “Anfield is obviously a very difficult place to come for every team. “As defenders – and everyone in the team – we try to keep a clean sheet because we know if we do that we have a big chance to win the game. Liverpool have conceded only three goals in their opening eight Premier League games this season – compared to 12 in the same period last term. 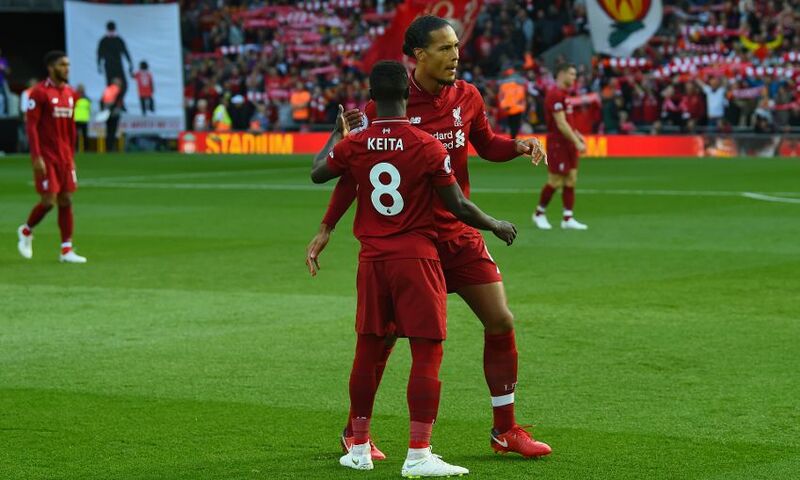 Reflecting on that improvement, Van Dijk said: “How we defend all together, how we press together – it starts up front – we can make life difficult for everyone. Klopp’s men concluded an intense run of seven games in 23 days when they battled City in their last outing before the current international break. Testing ties in the league and Europe put early-season demands on the team but Van Dijk insisted fatigue did not come into play for the squad. “We’re fit and everyone wants to play every game. You don’t become a footballer to get a rest; you can rest when you finish your career,” the Dutchman said.